A Eurasian species of railroads, roadsides, farmyards, fields, disturbed sandy or gravelly shores, and other disturbed habitats. Evidently spread early to Michigan, for the first collections in the state were made in 1838 (Jackson Co.) and 1840 (Macomb Co.). 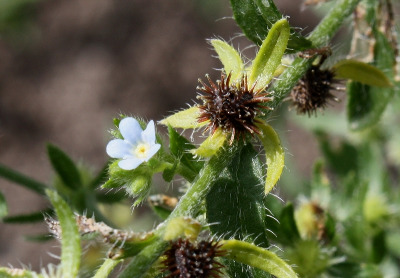 This is an easily overlooked but readily recognized plant, with stiffly erect habit (stems simple or much branched), tiny blue flowers, and numerous narrow leaves. The margins of each nutlet have 2 rows of barb-tipped bristles. MICHIGAN FLORA ONLINE. A. A. Reznicek, E. G. Voss, & B. S. Walters. February 2011. University of Michigan. Web. April 21, 2019. https://michiganflora.net/species.aspx?id=576.